The Milford Historical Society is a 501(c)3 non-profit organization founded in 1973 with the mission of collecting, preserving and sharing the history of the Milford, Michigan area. We are an educational organization with the Milford Historical Museum in Milford, Michigan serving as the primary vehicle for our efforts to educate the local community about the history of the area. An important part of or mission involves engaging local high school students to share the area history. Students volunteer at the Museum as docents (guides) over their final two years in high school. Those who complete 100 hours of service as docents by the time that they graduate are awarded $1,000 scholarships. We usually award 2 or 3 scholarships each year. The Milford Historical Society has created a dedicated Endowment Fund which will be invested to provide income for these student scholarships, as well as supporting the operation of the Milford Historical Museum with any earnings beyond that needed for the scholarships. At the current rate of return on conservative investments, we estimate that a fund of $60,000 should be sufficient to provide for the annual scholarships. We have also provided for the naming of each scholarship on behalf of the donors, should any single donation be made at a level of $30,000 or more. Scholarships may be named for individuals or for corporations. Scholarships are awarded at the end of each school year to the graduating seniors who have completed their service requirements at the Museum. 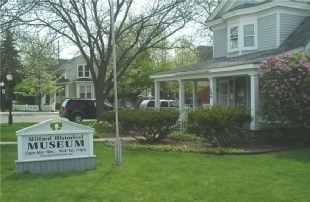 The Milford Historical Museum is located at 124 E. Commerce Street in Milford, Michigan 48381, and is open from 1 – 4 PM on Wednesdays, Saturdays and Sundays. The museum displays historic memorabilia that has been donated by area residents as well as featuring a second floor that is furnished and decorated just as a turn of the century hoe might have been in Milford in the late 1800’s. In addition, the museum staff provides history research for those doing genealogical work or who want to know the background of the Milford home. The Milford Historical Society maintains at the Museum an archive of every issue of the Milford Times news weekly since its beginning in 1871 and also has an extensive photo collection of historic photos and sells reproduction prints of selected photos. This entry was posted on Saturday, September 26th, 2015 at 12:08 pm and is filed under About Milford Michigan. You can follow any responses to this entry through the RSS 2.0 feed. You can leave a response, or trackback from your own site.